I've been a full time university student for many years. An aunt gave me a set of round looms January 2012 and I've been knitting in my spare time since! I am also a self-taught needle knitter and crocheter. Ever since January I've made dozens of things and have been known as a prolific knitter/crocheter in the family. I generally post about tips and tricks, and like to figure out how to transpose needle knitting techniques to loom knitting. With the emergence of Spring I've switched to practicing lace knits. This is one of the latest ones I've tried. Unfortunately I couldn't find my biggest loom so I could only practice one column. People said the patten was easy on ravelry. I honestly thought it was confusing because the pdf was messy, and went back and forth. The underlined words made it hard to read. Can you guess I'm not good at chem labs? I would be the equivalent of Ron in potions class. I persevered though as you see. Check out the link and try it yourself. Tell me how it goes! I was looking through some links, and found this post from Anne Bipes ages ago. It's great! 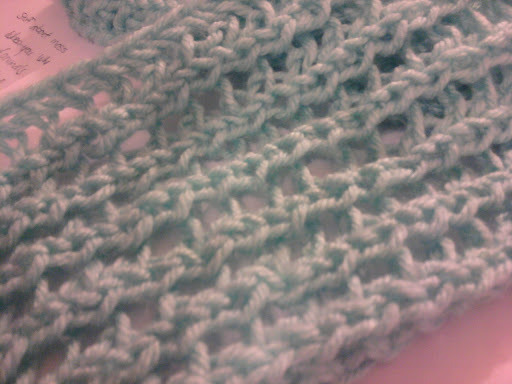 Using a lifeline so that when you frog it, you'll still have your knit pieces up to a certain point. I wish I thought of this before - especially when knitting large pieces of work like scarves and shawls. I don't think I could keep this up every Saturday, but maybe every other weekend would be sufficient. Anyways, here are some simple youtube videos that I think can be very useful when you're starting out! 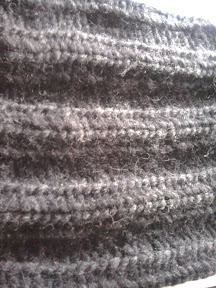 I haven't found a short and simple tutorial about the stockinette stitch, which is a shame though. Anyways, check out the full page to view my commentary. I've been practicing some lace patterns because of the unusually warm march weather. I really hate the cast on I did for this lace sample. I like how it is scalloped but I really dislike the loose loops. 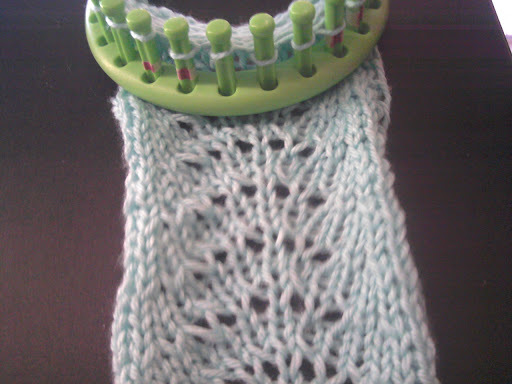 I haven't figured out which cast on I like for lace yet. Anyway, this design is actually Isela Phelp's fern lace pattern, so view the full post to see the video on how to do it. If you try it, make sure to tell me how yours worked out! I used a Knifty Knitter, so it wouldn't look as good as a loom with a smaller gauge. What do you think this is? Why it's a 2x2 rib knit sideways! I really don't know why it's sideways, but it's part of my winter hat, which is unfortunately useless in the warm weather we have been experiencing in the last week. I knitted this a couple of weeks ago using non-worsted yarn (I don't know if there's a term for that). This is less complex compared to the cable knit hats I made for my mom and sister, but it's so comfortable and simple. Spring is near... Or here already! So I started knitting a lace scarf. It's been busy so I haven't had time to think of a design, so I used a free lion yarn pattern again. It's quite easy, you just need to know k2tog and yo. I made a few mistakes I didn't catch too far into knitting that I couldn't frog it, so I kept on going. The times when I could catch them, I messed up going backwards to fix it. I'm not used to the e-wrap because the twisted stockinette is a stitch I quite despise. My greatest mistake was slipping the stitch at the ends when turning. I realized this too late, but I won't make the mistake again! I love the nice braid that comes with slipping a stitch but the garter stitch needs to be done on both ends to prevent curling. It's a lace pattern so the curling isn't as noticeable. I still haven't weaved in the ends yet, but it is nearly 1 am. Since I just got a long loom, I've been playing around. I tried out a free pattern from lion brand yarn and double knitting is great! 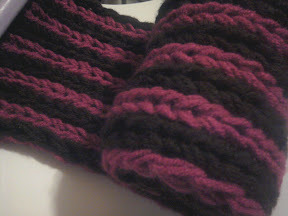 Too bad this is acrylic yarn - I wish I had more buttery, rich yarns. I will be posting a long tail cast on tutorial for double knitting soon! It's my day off school today, and I've decided to learn how to do double knits on looms. I'm also looking up different cast-on methods for long looms. As school makes me busy, I hope I can post fairly regularly, because there are a great number of links out in the world, which have been useful to me. I hope to do that weekly, at least! So my story for loom knitting? My aunt bought me a loom set, I tried it out, thought that e-wrap stitches (twisted stockinette) were the fugliest thing in the world. 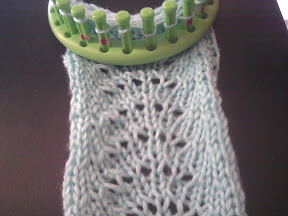 I found that normal knit stitches and purl stitches can make a lot of beautiful patterns, and here I am today. I shall be posting things I have made, and my mistakes with them (I've made a lot) later! A student with a need for creativity and something to keep my mind off of schoolwork. Knitting can be challenging at times, but I don't have to sit at the computer for 6 hours and ponder how certain readings relate to my thesis. I also am experimenting with regular knitting needles and crocheting, but loom knitting requires less thought.